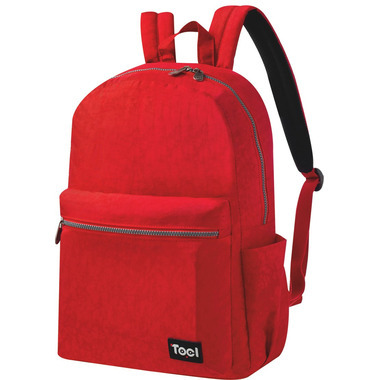 This backpack is made of durable washer wrinkle fabric, constructed to withstand daily commutes to the schoolyard, office, campus or gym. It features a large zippered main compartment and has a side water bottle pocket as well as an additional exterior zippered pocket for those quick access items. The bag features a fully padded back panel to guard against bumps from books and laptops and has super comfortable ergonomic S-curve shoulder straps. With ample pockets, ergonomic design and the option to throw it in the washer for an easy clean, this bag checks all the boxes.